We recently had a great write up with our friend Nikia Jefferson and our new friends Marie Claire Magazine. Check us out below and tell us what you think! The first thing you notice about Brian and Autumn Merritt is their vibe. They're hip (they have multiple tattoos) with a traditional edge (they have two kids and recently appeared in a Honda Civic commercial). The brand that they run together, Sir & Madame, echoes that combination: It sells timeless pieces like button-downs and sweatshirts decorated with embroidered badges and bold graphics. The Merritts founded their company in 2007. They were about to get married and, as happens when moving in with a significant other, Autumn was shocked by the contents of Brian's closet. He had way too many sneakers ("Sneaker culture was at its peak!" he explains). Plus, the two were looking for a career pivot. Autumn, now 34, had just been fired from her job as a buyer at a local Chicago boutique, and Brian, now 36, was bored with his job managing Chicago Apartment Finders. From their discontent (and overabundance of kicks), a business was born. Aptly named Solemates, their company, Chicago's first sneaker consignment shop, attracted all the cool kids. In 2009, the Merritts expanded the shop's inventory to include their own designs and rebranded the store Sir & Madame. Recently, the couple moved their outpost from Wicker Park to Hyde Park. They've known each other for more than 20 years—they first met in middle school—yet entrepreneurial life has been the real spark to reveal new depths in their relationship. Autumn works Sir & Madame's floor, selling pieces Brian designs: "When I see people react to what we have in the shop, I'm like, 'Yeah, babe, you did a great job!'" she says. And Brian affectionately refers to his wife—who often sits in on his meetings with manufacturers—as his "pit bull" for keeping the trains running on time. "Seeing every day what this person has worked toward to ultimately better your situation or your business," says Autumn, "just increases your respect and love." But it's not all fun and fashion. 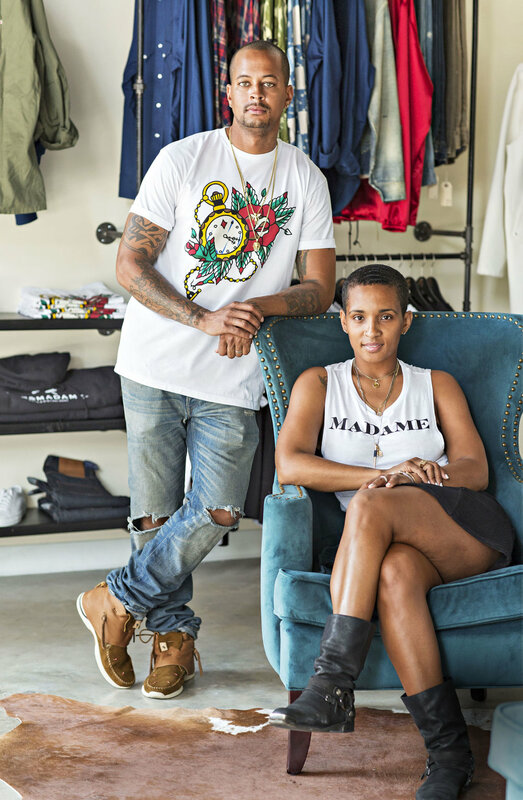 When they first launched, Autumn took on additional work to help pay the bills, while Brian manned the bulk of their store's internal- and external-facing operations. He was drowning. She scaled back her gigs to get more face time in the store, allowing Brian to focus on the company's back end. There was also that time Brian charged a large shipment to their account without giving Autumn, who oversaw the budget, a heads-up—nearly putting the company in the red. The accounting discrepancy bled into their home life. "Our disagreements led more to silence than anything," Autumn says. It's taken 10 years of experience to really learn how to leave work at the office, and now they approach most situations with less emotion and more practicality. "We baby-stepped our way to a healthy place," says Autumn. "It's something that's going to continuously evolve." Much like Sir & Madame. Read more about how other fashion couples make it work here.